To View Brochure – click on the brochure image on the right. 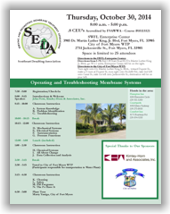 Onsite registration will be available at the SEDA Registration Desk starting at 7:30 a.m. Monday October 21, 2013. 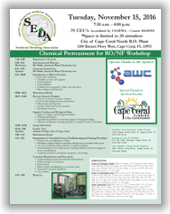 If you would like to register onsite for this workshop, please print and fill out the Registration Form (on the last page of the brochure, click image) and turn it in at the onsite SEDA registration desk. 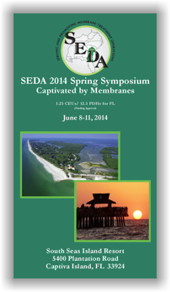 Onsite registration will be available at the SEDA Registration Desk starting at 7:30 a.m. Tuesday April 1, 2014. 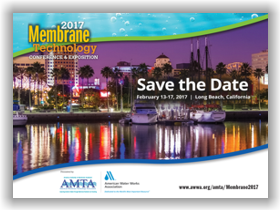 Join membrane plant operators, managers and experts in the membrane industry and be captivated by membranes as you learn about the latest in regulations, membrane technology applications and operations/maintenance for water and wastewater treatment systems. 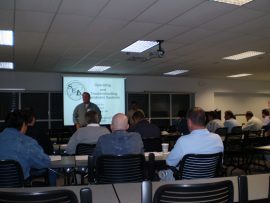 Offerings will include small group hands-on sessions and a membrane plant facility tour. Operator CEUs/Engineer PDHs are available. Onsite registration will be available at the SEDA Registration Desk starting at 7:00 a.m. Monday, June 9, 2014. 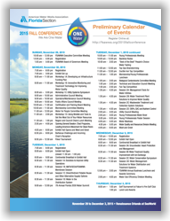 If you would like to register onsite for this conference, please print and complete the Registration Form (click image, last page of the brochure) and turn it in at the onsite SEDA registration desk. Space is limited to 30 attendees – 7:30 a.m. – 4:00 p.m. Registration is closed, this workshop is now at capacity. 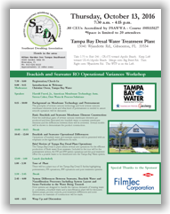 This AMTA-SEDA Technology Transfer Workshop will focus on the application of membrane technologies in the Low Country Region. Attendees will learn about MF/UF/NF/RO Membrane Processes, Differences in Membrane Properties, Pre- & Post-Treatment, Membrane Concentrate Disposal and the meeting will feature several Membrane Case Studies. 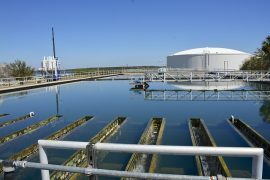 Also, there will be an overview and tours of the Mount Pleasant Membrane Treatment Plant and the Isle of Palms Water Treatment Facility. This workshop is full. Registration is now closed. 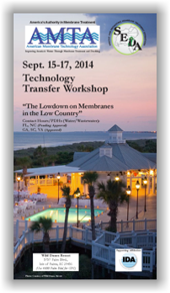 The Workshop will focus on membrane technology and the membrane elements that are used for WTP facilities. Discussions will focus on how membrane plants are operated, influences of factors such as temperature, pressure, TDS and what to be looking for in day to day operations. 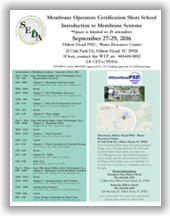 There will be a discussion on how membrane elements are made and examined during troubleshooting efforts. Finally, a brief review of water chemistry in membrane operations and some of the mathematics related to membrane plants will be presented. This Workshop would be useful to operators new to membrane operations as well as a refresher course for experienced operators. 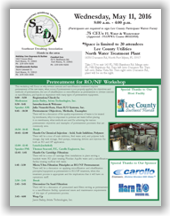 MON02 SEDA Pre-Conference Utility Managers Workshop: The program will provide an explanation of the increasingly strict water quality standards, lower raw water quality, and how membrane technology plays a role in dealing with these issues along with a presentation of existing membrane plants to show locations. 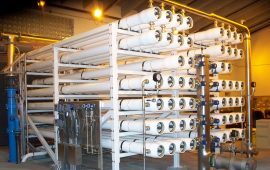 A simplified explanation of reverse osmosis principles and quick run through of a treatment train will be presented followed by a video walk-through of three membrane plants and a panel discussion of morning speakers. There will be an explanation of the requirement for additional technical staff, increase in staff training and level of competency, higher energy costs, and a presentation of historical plant construction and operating costs related to water rates. There will be a presentation on how to plan for funding the needed replacement of aging facilities, or asset management, a panel discussion of afternoon speakers and a description of SEDA’s role and function. Lunch is included. 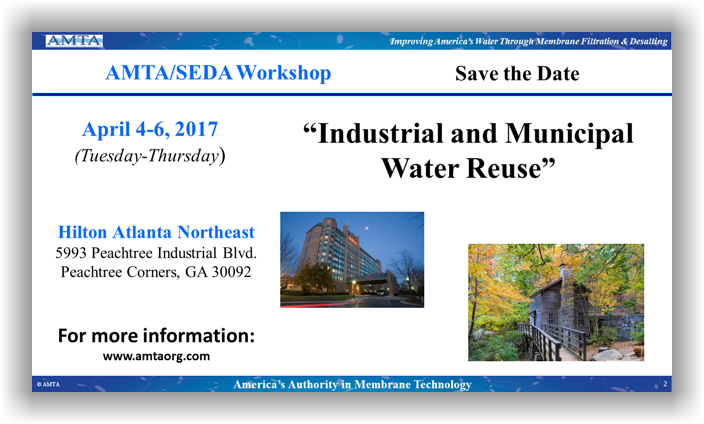 For more information and registration please visit: www.awwa.org/amta/membrane15 or call 1.800.926.7337. Registration is closed; this workshop is now at capacity. Registration is closed; this MOC Short School is now sold out. The Cruise is now SOLD OUT, if you are interested on attending the Cruise, you will be placed on a stand-by list. Pre-Registration is now closed, Onsite Registration will open on Sunday, June 14th at 2:00 p.m. at the Hotel. Make your lodging arrangements directly with the Hutchinson Island Marriott Beach Resort & Marina by clicking the link or by phone at 800-775-5936 and refer to SDASDAA for the discounted room rate. A group rate for single/double of $129 has been negotiated for reservations made by May 22, 2015 (subject to availability). If you need assistance making reservations, please call 1-800-775-5936, and ask for group code SDASDAA. This MOC school is full, registration is now closed. Wednesday, Oct. 21, 2015 | 7:30 a.m. – 4:00 p.m.
Onsite registration will be available at the SEDA registration desk starting at 7:30 a.m. Wednesday, October 21, 2015 . 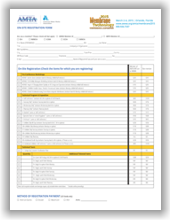 Please print the registration form on the back page of brochure, complete form along with payment information and return to the SEDA Onsite Registration Desk. 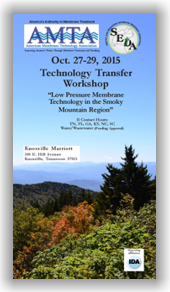 This AMTA & SEDA Technology Transfer Workshop will focus on Membrane Treatment in the Heart of the Great Smoky Mountains. 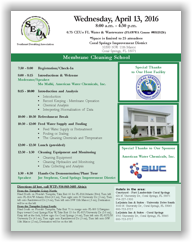 Attendees will learn about a basic overview of various membrane technologies including MF, UF and MBR followed by an overview of the South Blount Water Treatment Plant. The first afternoon will include an onsite facility tour. 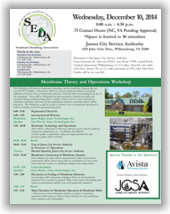 The workshop will also highlight SEDA’s Membrane Operators Certification Training module for membrane plant operators, a must for all membrane facility operations personnel. The first day will conclude with a Fun Networking Event. The second day will include case studies and design issues followed by an eight member panel discussion led by the major leading low pressure vendors primarily concentrating on low pressure membrane advances and impending issues. The second day afternoon sessions will conclude with a Membrane Integrity Testing presentation, local Regulatory & Permitting discussion and further talk during a presentation of new developments in the hollow fiber/nanofiltration industry. We look forward to your attendance and participation. Onsite registration will be available at the AMTA registration desk starting at 3:00 p.m Tuesday, October 27, 2015. Please print the registration form on the back page of brochure, complete form along with payment information and return to the AMTA Onsite Registration Desk. 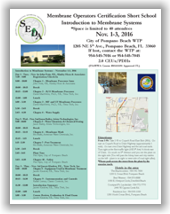 Onsite registration will be available at the SEDA registration desk starting at 7:30 am Wednesday, November 4, 2015. Online attendee registration is now open! 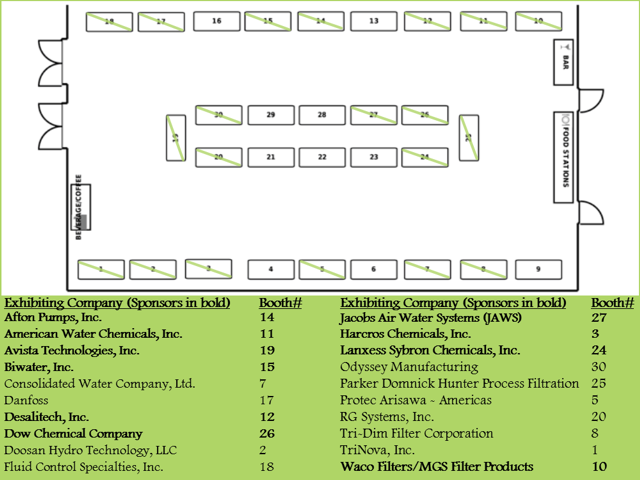 Exhibitor registration for the 2015 FSAWWA Fall Conference! Our host hotel is the Renaissance Orlando at SeaWorld. 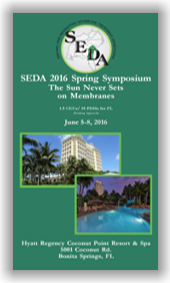 Registration for the 2016 Membrane Technology Conference & Exposition is now open! For full details please click the link to view the MTC Technical Program, MTC Announcement or 2016 Technical Highlights flyer. 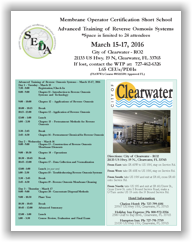 For more information, visit http://www.awwa.org/amta/membrane2016 or call 1.800.926.7337. 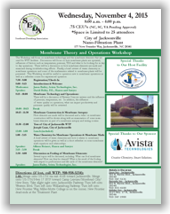 This workshop will focus on why reverse osmosis and nanofiltration treatment requires pretreatment of the raw water, what occurs if pretreatment is not properly applied, the objectives and methods of pretreatment, the use of ultrafiltration or microfiltration as pretreatment to reverse osmosis or nanofiltration, and hands-on experience with many types of pretreatment equipment. Participants are required to sign the Lee County Participant Waiver Form. 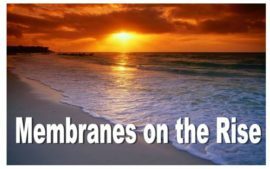 Join membrane plant operators, managers and experts in the membrane industry to find how membranes shine in the sun as you learn about the latest in regulations, membrane technology applications and operations/maintenance for water and wastewater treatment systems. 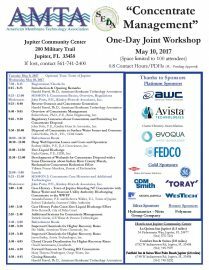 Offerings will include small group hands-on sessions and a membrane plant facility tour. Operator CEUs/Engineer PDHs are available. 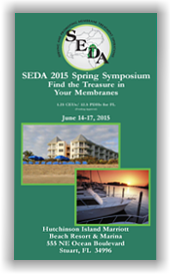 The Southeast Desalting Association (SEDA) is in the process of developing the program for its Annual Symposium which will be in Bonita Springs, FL on June 5-8, 2016 at Hyatt Regency Coconut Point. Please email planning@southeastdesalting.com or call 772-781-7698, if you have any questions. Sponsor/Exhibitor Registration is now open! 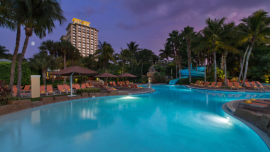 Make your lodging arrangements online directly with the Hyatt Regency Coconut Point by clicking the link or by phone at 888-421-1442 and refer to Southeast Desalting Association (SEDA) for the discounted room rate. A group rate for single/double of $159 has been negotiated for reservations made by May 9, 2016 (subject to availability). This workshop is SOLD OUT – Registration is now closed. This event is being rescheduled, please check back for the new date. Please click the link above for more information on this event. The City of Palm Coast has applied various technologies to convert the RO/NF concentrate streams from both of their plants to potable water. In doing so, they have essentially eliminated the need for concentrate disposal while maximizing their total output. Technologies used for the ZLD processes implemented by the City include Ultrafiltration, Lime Softening, Coagulation, Chloramination and Ozonation. 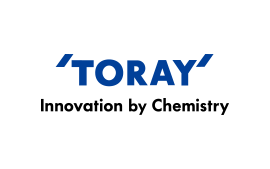 The purpose of this workshop is to explain how the different concentrate treatment technologies were applied, and to explain the chemistry and mechanisms of each part of the process. This class is being rescheduled, che ck back for updates soon. This class is being postponed…check back for updates. 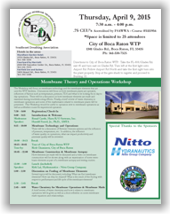 Water Quality & Energy Efficiency through Membrane Selection Workshop – Wellington, FL. MOC I – Cape Coral, Fl. MOC II – Clearwater, Fl. 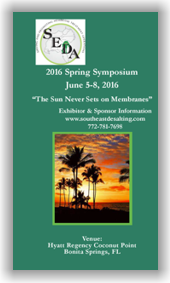 The 2018 spring symposium is going to be located on the beautiful island of Captiva, FL. 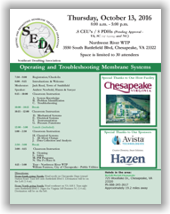 Join membrane plant operators, managers and experts in the membrane industry to find how membranes shine in the sun as you learn about the latest in regulations, membrane technology applications and operations/maintenance for water and wastewater treatment systems. 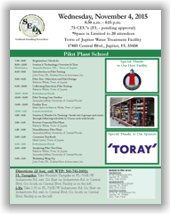 Offerings will include small group hands-on sessions and a membrane plant facility tour. Operator CEUs/Engineer PDHs are available. 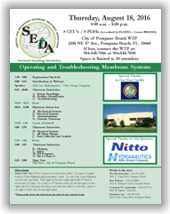 Come join our Operations and Maintenance of Degasifiers and Scrubber Systems on August 16th at the City of Pompano Beach Utilities! Call For Papers Spring Symposium! Come Join us for a joint 1 Day Targeted Workshop with AMTA!